Our low temps over night are still dipping down to around 20 or 25 below. The winds did abate a bit today. No loss of power that we've heard of. But still, the wind chill forecast is for 49 degrees below zero at this time. Schools will be closed for the third day in a row tomorrow. Some businesses in town are still open, others are closed. There was no mail delivery in the whole state of Minnesota today. It's not only the northern part of our state that has dangerously cold conditions. And other parts of the Midwest have been hit, too. Chicken Mama has come down with a bona fide case of influenza. Fortunately, she's not far from us so we're keeping her firewood supply handy (rather than her hauling it in herself) along with other necessities. My job has been to convince her she cannot rush into getting up and back to work or the results will be bad. The doctor told her as long as her lungs stay clear, she should be okay. But for others in the community, he's seen this flu go into pneumonia. Some have even landed in the hospital. So far, she's being good, but I have rope and I'm not afraid to tie her down. Papa Pea is taking good care of everything outside around here. I haven't been out since last Monday morning. He's currently known as the man in black. (Move over, Johnny Cash.) With his black super-insulated coveralls, black ear flap hat, black face mask and black mitts all in place he says he's comfortable when outside. He's also been wearing goggles (black rimmed) to protect his eyes when the wind is howling. Such a stylish figure he does cut. Unfortunately, I listened to that wind from 3 a.m. to 6 a.m. this morning. Out on the couch so as not to wake my bed partner. When hubby got up at 6, I crawled back into bed thinking I still wouldn't be able to sleep. Woke up at 9 a.m. so I think I gained back those hours lost in the night. All in all, we're surviving without any difficulty. We're warm and eating good. Meat loaf, scalloped potatoes, green beans, and fruit salad for dinner tonight. Cherry Cottage Pudding for dessert. All is well. Sending out wishes for warmth and safety for all of you. Are you still heating with the furnace this winter? I turned mine up to reduce the risk of frozen pipes this week but still mostly use the woodstove. Hope Chicken Mama makes a complete recovery and neither of you succumb. I was up at 3am this morning. Couldn't sleep as Hubby works the midnight shift in this weather. I've been wondering about your weather. We hit a windchill of -28°F Wed. night. Record breaking for us. Stay warm. That is so nice that you are close enough to help Chicken Mama. I hope she is better very soon. tpals - We didn't last long heating with L.P. gas, I'm afraid. I need to get a post up regarding that experiment! Knock on wood, both hubby and I have managed to avoid all the sick-i-ness around us. And there has been a lot of it this winter season. Chicken Mama is strong and tough and will be fine . . . if I can convince her to give herself a chance to recover completely before jumping back into the daily grind. Kristina - We had 26 below over night but the wind (thankfully!) has stopped! Having loved ones who has to go out in this frigid weather (that you have, too) causes a lot of concern for those at home! Thanks for the well wishes for our ailing daughter. Haven't heard from her today yet, but am hoping she feels a bit better. Poor kid! I know you will keep a close eye on her because that apple didn't fall far from the tree, if you catch my drift. I could just visualize Papa Pea in his NYC chic get-up. We are struggling through the polar vortex with everyone else. It was -15 when I got up this morning (3A must be a popular time for us bloggers...) and broke into a happy dance when it hit -9. So sad. We are finally reaching the end of the cold snap. My word that one was wretched. Schools closed, school buses not running (even in the city which is unheard of! ), ice fog, exhaust fog. I won't be sad to see the back of January. Keep warm and healthy you two! Susan - Chicken Mama says she's feeling a wee bit better this morning as far as the general all-over achy-ness goes, but she's now developed a cough which is nasty. She has arranged her working schedule and is NOT considering going back to work until Monday. Hooray! That will do her more good than anything. -26F here over night. Beautiful sunshine this morning and NO WIND! We have a warm -10F right now. MrsDM - Our daughter is being good (see above note to Susan). Her sinus headache is not good but no congestion in her lungs. Your weather, once again, seems to be much like ours. They say this afternoon will start to warm up and the coming weekend will be better. Let's hope! YOu people out there, are the talk of the news!!!!! More pics of people, dealing with the cold out there, on the front page of today's WSJ, again. Glad Papa Pea is prepared for it!!! Living with such possibilities, one has to be prepared. So sorry about your daughter!!!!! I'm sure she is like her parents, so hard to keep down, even when she should stay put. Good she's not too far away, and you can keep her supplied. But you be careful toooooo!!!! I'd be wearing my germ mask there. But betcha' you aren't. Tsk, tsk, tsk,,,, You don't want to get it!!!! YOu or Papa Pea. Who would do all your duties???????? YOu sound fully able to do fine, in this awful weather. But glad to have you post!!!! Just to keep us informed. wisps of words - Thank you for keeping a watchful eye out for us, my friend. But, ya know, if one uses common sense and is prepared for this kind of weather, it's not really that bad. We certainly aren't going for any all-day hikes or doing unnecessary traveling in vehicles. Even then we have emergency gear in the vehicles just in case. I've been amazed at how easily we've been able to keep it very comfortable inside here. Papa Pea attributes much of that to all the snow we have banked up around the house. Solid, dry wood helps and good stoves are a necessity, too! Also, clean, safe chimneys that my dear husband is nearly fanatic about taking care of. I think this period is about over for us at least. Other areas have had lower than normal temps PLUS heavy snowfall to deal with! I hope Chicken Mama recovers soon! I don't want to leave the house at all, it's so dang cold out there. Taking the dogs out 3-4 times a day is about all we can handle lately. Our cold spell is breaking in a dramatic fashion! By Sunday afternoon the claim is we'll hit 50F. -20F to 50F in less than a week: That's going to make a mess of about everything. Stay warm and be well! Oh dear, poor Chicken Mama. Not a good time to be so sick. :( It's a blessing you live so close to her. Glad to hear you've hunkered down comfortably, yourselves. Rain - I know what you mean. When it hurts the minute you step out the door, that tells me it's just TOO cold! Fortunately, our weather seems to be warming up now. We were only a few digits below zero this morning! Mark - I know you've had way too much experience with pneumonia and hospitals . . . unfortunately. She felt better yesterday already although a bad cough has set in which is hampering her sleep. Darn. Just when one needs sleep to get well! But she's definitely agreed to stay home through the weekend so I haven't had to tie her down yet. I'm going to mention to her that you are the sad sweepstakes winner of knowing how getting pneumonia can really be a bad thing! Leigh - They said our weather was going to take a turn for the better and, by cracky, it has! Of course, now that it's warming up, the forecast is for a bit of snow. Better than 50F below wind chill though! I hope Chicken Mama gets better. I'm reading about the 1918 flu pandemic ....she should read that while she's sick. It's pretty awful. My stepfather's parents both died in it when he was 3 years old. Anyway, it sounds like Papa Pea is one of those on the 'Best Dressed List' for the Polar Vortex. If I ever get back North I might have to take a few tips from him. Your dinner sounds so good and what is Cherry Cottage Pudding? It sounds delightful! Would you like to send me an e-mail? If so, click on the icon below! 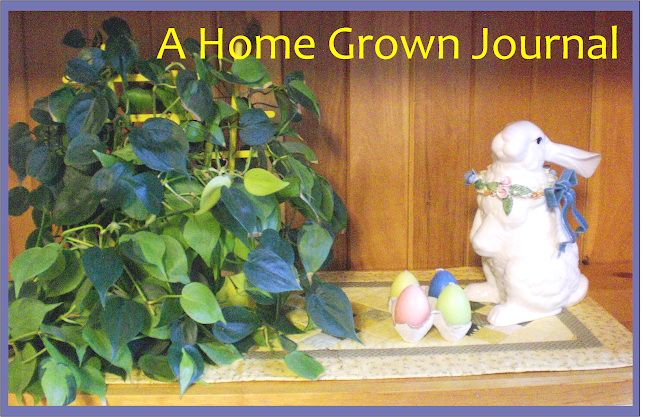 'A Home Grown Journal' Readers: Welcome & Thanks For Visiting! Ewe's Crazy & So is I ! It Must Be Spring Because It Feels Like a Three Ring Circus! I live with my husband on a small homestead in Northeastern Minnesota. Our daughter (Beyond the Fork in the Road) currently lives in a small cabin in the woods not too far from us. Our place is located outside a small tourist town and a two and a half hour's drive from the nearest big city. Trips to the city are infrequent, well-planned, and exhausting! We currently raise chickens and have hives of honey bees. Raising some of our meat and most of our fruits and vegetables is a priority for us; so, along with our birds for meat and eggs, we have fruit trees, berry patches and a huge vegetable garden. Quilting is my passion, and I could happily spend each day in my quilt studio if I weren't happily spending each day out in the garden. Good thing we have winters up here; Mother Nature helps keep my life balanced. Have a particular posting or topic in mind? Want to find that post Mama Pea wrote about her blueberry bushes or the geese? If so . . . .
All images and text are property of 'A Home Grown Journal' & may not be used without permission.